Optoma introduced the compact, ultra short throw projector range, a complete package with 330UST & 335UST series specially designed for business and education applications, followed by HD30UST for the home cinema sector. At 3600 lumens, Optoma’s compact, ultra short throw projector range includes Full HD 1080p, WXGA and XGA resolution models. It is 18.8% lighter than the previous version, with less than 4kg of weight, while incorporating a built-in, powerful 16W speaker. Equipped with an added benefit of vertical and horizontal keystone, as well as four-corner geometric adjustment, Optoma’s compact, ultra short throw projector range allows quick, intuitive, accurate installation, ideal for uneven walls or places where a projector placement is awkward or needs a certain angle. “According to The Market Reports, the global Ultra Short Throw Projector market will reach US$ 4,260 million by the end of 2025, growing at a CAGR of 28.3% during 2018-2025. 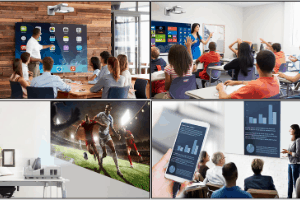 Optoma sees the increasing demand, and launches a complete package of ultra short throw projector series to fulfil all sorts of requirement, including meetings, classrooms, retails, homes, and more!” said Gordon Wu, Assistant Vice President at Optoma APAC. Optoma’s compact, ultra short throw projector range requires little maintenance with maximum 15,000 hours of lamp life, no user serviceable parts inside, nor filter needed periodic replacement. It provides solutions for BYOD (Bring Your Own Device) scenario, including USB display, MHL display, WiFi display (*optional), as well as LAN display, allowing consumers to easily share their device content to the big screen. In addition, Optoma’s compact, ultra short throw projector range supports extensive connectivity with multiple inputs, such as HDMI, VGA and RJ45. An audio input in is also included which cuts out the need for additional costly audio hardware and cabling. For wireless presentations from a laptop or mobile device, the Optoma wireless WUSB adapter (sold separately) can be connected to the USB output. Optoma Introduces a New Range of Ultra Short Throw Projectors in India 0 out of 5 based on 0 ratings. 0 user reviews.